Customers using clients with public/private keypairs — This issue does not affect environments using public/private keypairs where the client has never had a password set up. If the client has used a password, see steps below to remove it. The latest versions of Retrospect are available from Downloads. These include a security update to address the CERT vulnerability. Download the latest version of Retrospect and update the Retrospect Engine and all Retrospect Clients. Update each client’s password. See Retrospect for Mac documentation and Retrospect for Windows documentation for specific steps. This can be the same password that they already have. This process is necessary to remove the security issue, by replacing the affected password hash with a new unaffected one. Public/private keypairs allow Retrospect Client to automatically authenticate with the Retrospect Engine without the need for a password. Switching to public/private keypairs ensures your clients are not exposed to this risk, and you can set them up without upgrading to the latest version of Retrospect. Our User’s Guide walks through how to set these up. See Retrospect for Windows documentation for instructions on creating public/private keypairs from Preferences. Add the public key to each client. See documentation for re-installation instructions. In Clients, remove the client and re-add it again to start using the public/private keypair. You will need to re-add the clients to their respective scripts. You can verify the authentication method by looking at Clients > Properties > Tools. It should list "Security: uses private/public key". Retrospect Desktop for Windows — Public/private keypairs are not officially supported in the Desktop edition of Retrospect for Windows. However, you can take steps to use them in your current environment. Please contact Support for more information. Create a public/private keypair. See documentation for instructions for doing so in Preferences. In Sources, remove the client and then re-add it again to start using the public/private keypair. You will need to re-add the clients to their respective scripts. You can verify the authentication method by looking at Sources > Summary. It should list "Security: Public/Private Key". Windows XP — Place the public key at C:\Program Files\Retrospect\Retrospect Client\pubkey.dat. Windows Vista, 7, 8 — Place the public key at C:\Program Files (x86)\Retrospect\Retrospect Client\pubkey.dat. 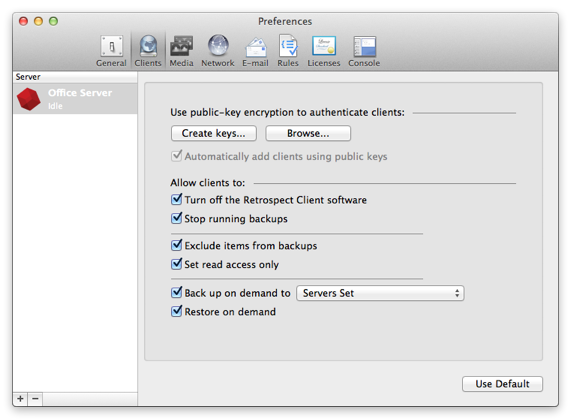 Mac OS X 10.6 - 10.10 (12.0.2) — Place the public key at /Library/Preferences/pubkey.dat. Linux — Linux client releases prior to 10.0.2 do not support public/private keypairs. Please contact <a href="/en/support/phone">Support</a> if you are running a Linux client prior to 10.0.2. Retrospect Client does not store the password you type in. Instead, it stores a computational hash of it and uses that hash to authenticate with the Retrospect Engine. The hash is generated by an algorithm designed to prevent others from being able to guess the original password or pick a different password that generates the same hash. However, a bug in the algorithm significantly increases the likelihood of a different password matching the original password’s hash. A sophisticated individual with a significant amount of technical expertise and network access to this Retrospect Client could use this bug to gain access to the Retrospect Client and the computer it runs on from a different Retrospect Engine.